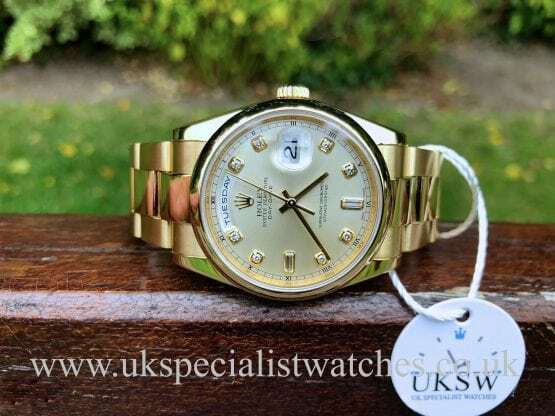 Rolex Datejust midsize with a solid 31mm 18ct yellow gold case, stunning factory Rolex diamond bezel and white Roman Dial. Fitted to a 18ct yellow gold president bracelet with concealed folding clasp. Powered by an automatic self winding movement. Supplied new in 1982 and comes with Rolex outer box and red inner box, red leather wallet. This watch is in absolutely amazing condition with very little stretch to the bracelet. Official Rolex service receipt dated 2015. 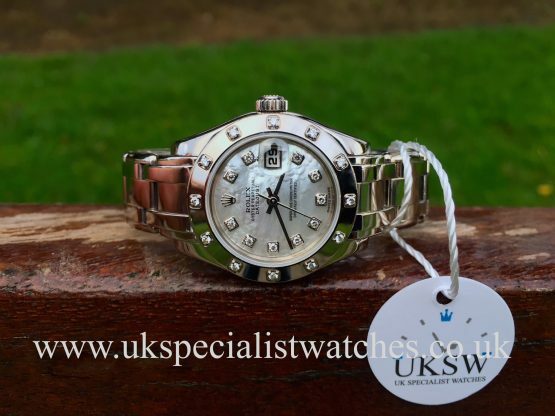 Rolex DateJust 178274 Ladies midsize. 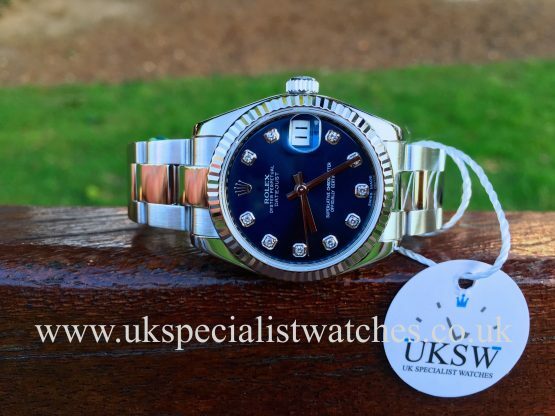 With a 31mm polished stainless steel case and a factory Rolex blue diamond dial set with 10 brilliant cut diamonds.18ct white gold fluted bezel . Sapphire crystal glass, water resistant to 100m. Fitted to a solid link stainless steel oyster bracelet with double folding clasp. Powered by an automatic movement. Supplied new Aug 2013 and comes totally complete with all original boxes, papers, warranty card, booklets, swing tag and original receipts. 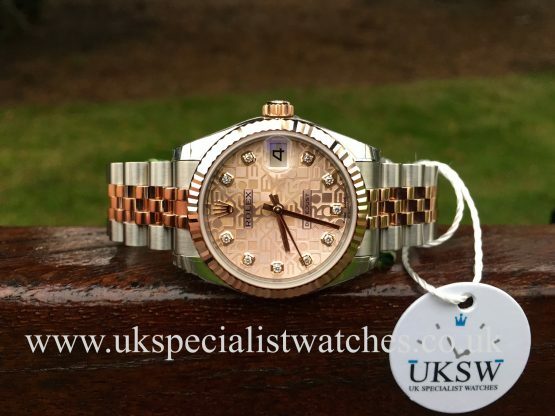 Rolex DateJust 178271 with a 31mm mid-size 18ct rose gold & stainless steel case. 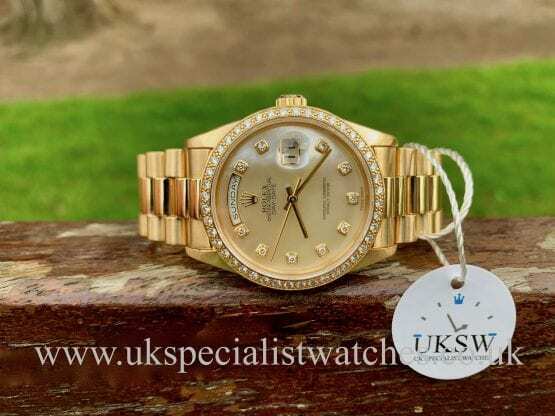 Rolex Pink Jubilee Diamond Dial. 18ct rose gold fluted bezel. Fitted to a solid link 18ct Rose Gold & stainless steel Jubilee bracelet and concealed double folding clasp. Sapphire crystal glass, water resistant to 100m. Our UNWORN / UNUSED 2016 example comes complete with its original boxes, stamped warranty card, swing tag and the Rolex 5 year international warranty. This watch costs €11,100 in Europe! 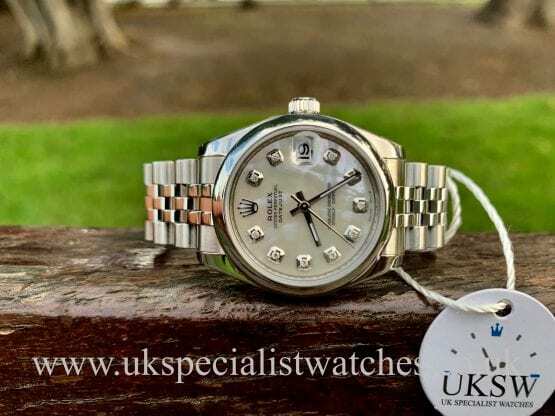 Rolex DateJust 178384 with a mid size 31mm stainless steel case. 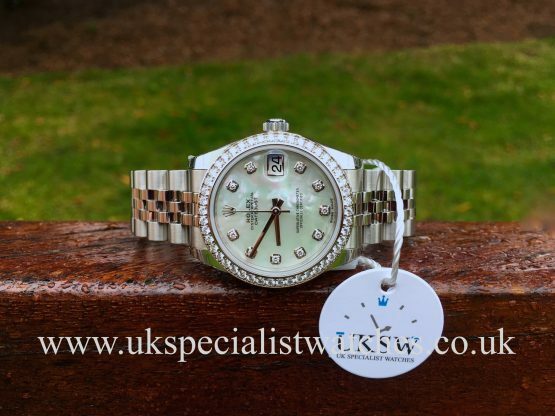 Rolex Mother Of Pearl Diamond Dial. 18ct white gold diamond bezel. Fitted to a solid link stainless steel Jubilee bracelet and concealed crown clasp. Sapphire crystal glass, water resistant to 100m. Our UNWORN / UNUSED 2016 example comes complete with its original boxes, stamped warranty card, swing tags and the Rolex 5 year international warranty. Costs new today £13,650! 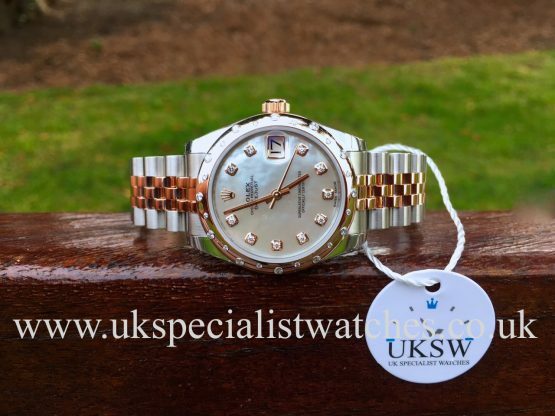 Rolex Datejust Mid-Size with a 31mm Rose Gold and steel case, factory Rolex mother of Pearl diamond dial and solid 18ct rose gold smooth scattered diamond bezel. 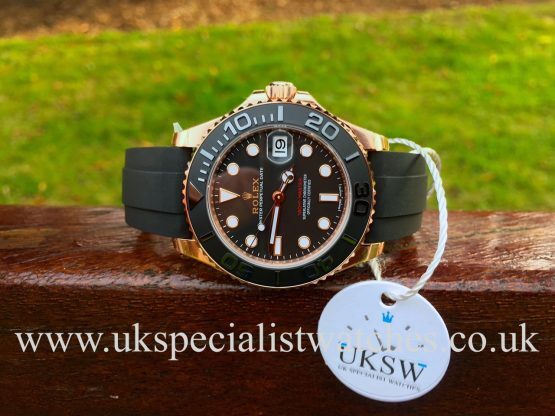 Fitted to a solid link 18ct Rose gold and stainless steel jubilee bracelet with concealed crown clasp, sapphire crystal glass & water resistant to 100m. 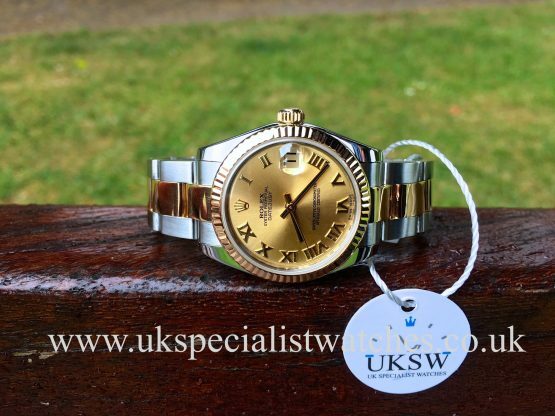 This beautiful 2016 UNWORN & UNUSED watch has all the case and bracelet stickers still intact and comes complete with its original boxes, stamped warranty card, swing tag and the Rolex 5 year international warranty. Costs new today £13,050! 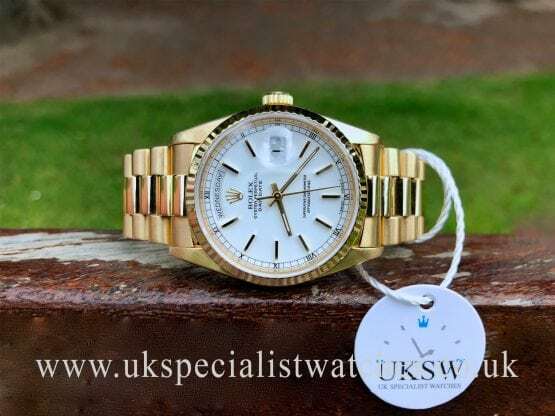 Mid-size Rolex Watches UK – UK Specialist Watches is one of the leading luxury mid-size rolex watch dealers in the United Kingdom and have a wide-range of new unworn, used, pre-owned, second hand, pre owned, secondhand mid size rolex watches available to browse and purchase. We are always here to provide expert advice and guidance. 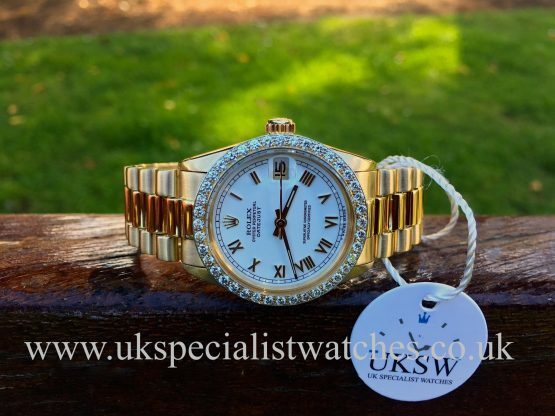 If you would like to sell your rolex - we’d be happy to hear from you. Please do not hesitate to contact us should you have any questions.